Chances are you've never been to Romania. But if you're from certain parts of America, it would likely remind you of home. Its four distinct seasons render much of the year cool and wet-like that of the American Northwest. Dense vegetation in Romania's Carpathian foothills merges with farmland plains outside cities like Brasov in much the same as our Blue Ridge Mountains meet Appalachian lowlands in western Virginia. Dilapidated, forgotten-about industry in post-Soviet mining towns like Petrosani and Rosia Montana could blend seemlessly into the rural eastern-central Pennsylvania landscape. And while we might not have to deal with crumbling roadways that likely haven't been re-paved since the cold war, motorists in popular parts of Illinois, Arkansas or New York would be hard-pressed to tell the difference. Likewise, Romania is just about the last place on Earth you'd expect to find this GT-R treading ground. When I stepped off the plane in the land where this beast was created, I was met with entirely different conditions. The landspace was rocky and brown, the air dry and hot, and everything in sight had the artificial, pre-fabbed look of modern, rapidly growing Americana. "Welcome to Phoenix," my contact greeted me, "Home of Vivid Racing!" The Financial Crisis of 2007-2009, as it will be called until next year, turned the tables of the global market. Citizens of China, Saudi Arabia and Russia became the world's new millionaires, while the American uber-rich lost billions. The falling value of the U.S. dollar helped foreign currency become more competitive. Prices of commodities and goods rose, and we responded by driving less, buying less and thus producing less, which continued the cycle. And to citizens of wealthy nations, our newly weakened dollar meant a firesale on U.S. goods. Enter Romania, a country with half the unemployment and 17 times the GDP growth rate of the U.S. Those who head Romania's growing industries-like Majaros Csaba, the owner of this machine-well . . . they suddenly found themselves with some disposable income. "We got lucky and found a used GT-R three months after it was released," explains Dan Mermelstein, co-founder of Vivid, "with intentions to make it a clean, Wald-inspired Vivid Racing shop car for SEMA." 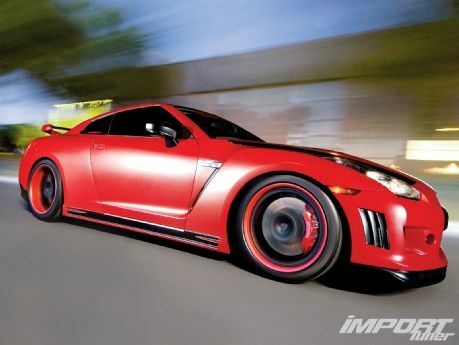 The plan was to build the GT-R into a rolling showcase for Capital Forged wheels, Vivid Racing's talents as installers and tuners, and the potency of their Agency Power line of performance products. Once back from SEMA, it would pound the streets of Phoenix, repping the Vivid extended family at shows and track days, and at the local gathering spots. But then Count Csaba caught wind of it. "He was on the phone with us the very next day, negotiating build specifics and a selling price," explains Dan. When a foreign Daddy Warbucks offers to fund your shop's project car build, in the middle of your country's second-worst recession of all time-you listen to what they have to say. "His vision of the perfect GT-R was slightly different than ours," explains Dan, tactfully. But hey-who were they to argue? Vivid's first step would be to alter the GT-R's appearance; a tricky prospect, considering the car had been on sale in the U.S. for all of three months. Importing genuine Wald aero components would take twice as long (with luck), and they weren't in any hurry to share their molds with Stateside competition. Dan's solution? Molding select portions of a Rieger Ford Focus front bumper onto the stock GT-R pieces (in the name of functionality-those bumper vents direct incoming air to the car's brakes), and joining Rieger E60 sideskirts with the GT-R's stock. The rear bumper was left OE, but risers were fabricated to lift the wing two inches off the trunk lid, and the whole car was re-sprayed flat red to separate it from its stock brethren, with flat black coats setting apart the roof, hood, wing, and newly added accents. Even the Capital Forged three-piece rollers were disassembled and given the treatment. The decision to prep the interior for occasional track duty was scrapped, at the customer's orders. Stock recliners were not ditched in favor of racing buckets, and a roll cage was not added-a move anyone familiar with Romanian roadways would appreciate. Rather, the stock interior was simply re-upholstered in red-stitched grey leather and red Alcantara, and given carbon fiber overlays. And who needs additional gauges in a car with a stock display that shows more engine vitals than the average motorist knows what to do with? Gauges stayed out, but additional audio went in, via two 10-inch Diamond Audio subs and a two-channel amp in the trunk, enclosed in matching upholstery. The main "problem" with modifying the GT-R really wouldn't be viewed as a problem at all by many-Nissan simply built it too well; dampening-adjustable shocks and 15-inch, two-piece Brembo rotors with six-piston calipers are fairly difficult to improve upon. In the case of the Vivid GT-R, they were left stock, but the car's stance was lowered and stiffened with Eibach Pro Kit springs-perfect for carving Carpathian mountain passes between Bicaz and Ceahlau. The engine, however, is a different story; the case can always be made for more power. The main wrinkle in increasing the GT-R's power is doing so without upsetting its delicate balance of tuning parameters. Fortunately, Cobb handles that problem with an Accessport featuring plug-n-play replacement maps that bump power in and of themselves, and allow for more even power to be made with the addition of bolt-on aspiration parts . . . like the Meisterschaft titanium exhaust and stainless mid-pipes, and Agency Power intake, intercooler piping and downpipes fitted to this GT-R-good enough for an additional 167 whp and 115 lbs-ft of torque.